The building of St George’s Church, George Town, Penang was started in 1816 and completed in 1818 under auspices of the East India Company, their charter having been extended for 20 years in 1813. Initial designs were proposed by Major Thomas Anbury, but built to plans by the then governor of Prince of Wales Island, William Pertie, which were modified by Lieutenant Robert N Smith of the Madras Engineers. Smith was a colleague of Colonel James Lillyman Caldwell, who was the chief architect of St George’s Cathedral in Madras and St George’s Church bears similarities to the cathedral in Madras. It was consecrated on the 11th of May 1819 by the Bishop of Calcutta, Thomas Fanshaw Middleton. The design is a combination of Neo-Classical, Georgian and English Palladian styles and was built of brick on a solid plastered stone base. It was built entirely by Indian convict labour. It is the oldest Anglican church in south-east Asia. The church was hit in a Japanese bombing raid in December 1941, which damaged the building badly. The church became derelict and much of its furnishings were looted the following year, including the pews, monuments, the organ and font, the last of these being returned to the church somewhat later. The church was re-opened for services in 1948 after its restoration. The inner city of George Town was recognised as a UNESCO World Heritage Site in 2008 and the church underwent a major restoration in 2009. The new organ is not the first to grace St George’s Church. 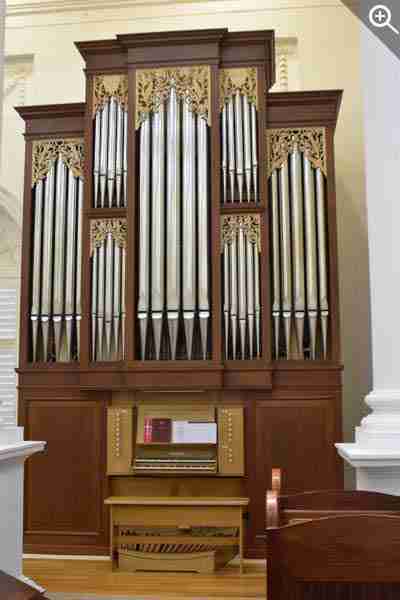 The first pipe organ was a second-hand instrument by Bryceson, which had been the choir organ at St Andrew’s Cathedral, Singapore. It was a one manual instrument of seven stops and was installed in 1888. In 1899, the firm of Forster and Andrews was commissioned to build a new organ of 16 stops, incorporating material from the Bryceson instrument. It was installed in the liturgical south-east corner of the church and appears to have had two simple pipe-array fronts, one facing down the church and the other facing the chancel, a typical arrangement for organs in Anglican churches at the time. In 1939, this instrument was rebuilt by an unknown builder and what has been described as magnificent casework was added, which was paid for by a private donation. This organ is just visible in a photograph taken some time between 1934 and 1941. There being no funds available for a new pipe organ after the war, the church was served by a succession of electronic instruments until the arrival of the new organ in 2017. We were first approached about a new organ by Andrew Yong, in 2012. He was representing the Tan family which had expressed an interest in sponsoring a new organ for St George’s Church in time for the church’s bicentenary. A contract was signed in 2016 and work was started later that year. Various suggestions for the placement of the organ were discussed. The last organ was sited in the liturgical south-east corner of the church and the new organ is in a similar position on the opposite side of the church. 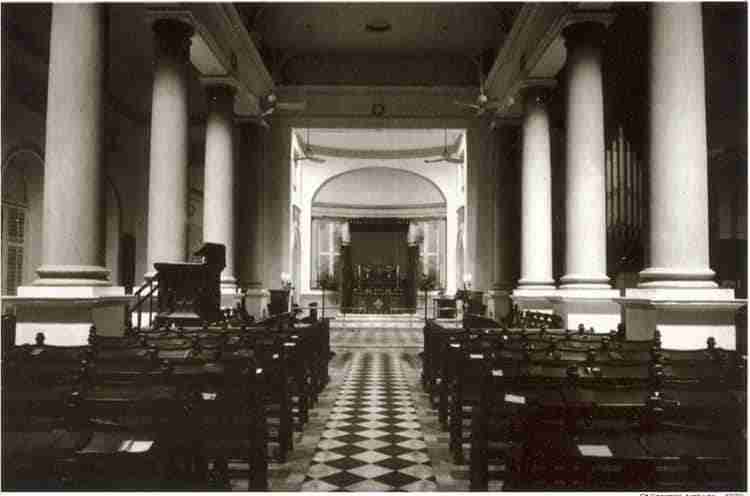 Up until it was bombed in 1941, the church sported a west end gallery, and there were obvious advantages to such a position, both acoustically and due to a shortage of space in the church. Ultimately it was decided that a new gallery was a project for the future, but as that option has not been ruled out for the future, the height of the organ was set so that this might be realised at some point. For now, it was initially proposed that the organ be placed against the south wall of the church, in the south aisle, and design proceeded along that position. However, as the design progressed, the option of placing it between two columns, making it free-standing seemed to be preferred, so the design was changed to allow access from the rear, access from the sides not being possible if the organ stood between columns. But discussions as to where the organ should be placed continued almost up to the point where the organ was to be shipped and the final decision was that the organ should go against the wall at the east end of the north aisle. This presented a problem as by now the design had progressed too far to be changed and access had to be possible from behind the organ to assemble it. Some resourceful members of the congregation had the solution. A moveable platform would be constructed so that the organ could be assembled, after which it would be moved to the wall and a platform would be constructed around the moveable platform once the organ was complete. The large inward-opening windows behind the organ were made to open outwards, so that routine maintenance could be carried out. A short video was made of the organ being moved in this way for the first time, which was done whilst the organ was being worked on! The case was designed to complement the architecture of the church and the timber selected and stained to be similar to the local timbers which were used at the time the church was built. It was decided that in the interests of easy maintenance, the organ should be entirely mechanical, both key and stop actions. Only the blower, tremulant operation and lighting employs electricity. The specification was conceived to ensure an instrument which would lead the congregation well and also to enable the development of a music programme and the performance of organ recitals once organists had been trained. It needed to be sufficiently versatile to encourage organists and choirs from other establishments in the far east to be attracted to it to bring a new cultural element to Penang and the surrounding area. The organ was consecrated by Archbishop Ng Moon Hing on the 23rd of July, 2017. View the Specification of St George's Organ (completed 2018) and pipe scales.